East London - South Africa shrugged off a floodlight failure to set New Zealand a challenging target in the second Twenty20 international here at Buffalo Park on Sunday. South Africa scored 165 for five in an innings reduced to 19 overs a side after the floodlight failure caused a 50-minute delay, leaving New Zealand a revised target of 169. Henry Davids hit 55 and captain Faf du Plessis made 63. New Zealand seam bowler Doug Bracewell took three wickets in four balls in the final over to finish with three for 33. Davids, playing in his second international match, made a maiden fifty before falling to a sensational catch by Jimmy Neesham, running back and diving full length to hold a lofted drive just inside the long-off boundary. Davids faced 38 balls. 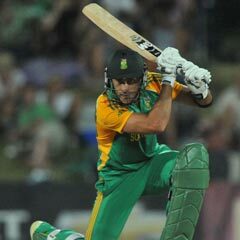 South Africa won the first match by eight wickets in Durban on Friday.